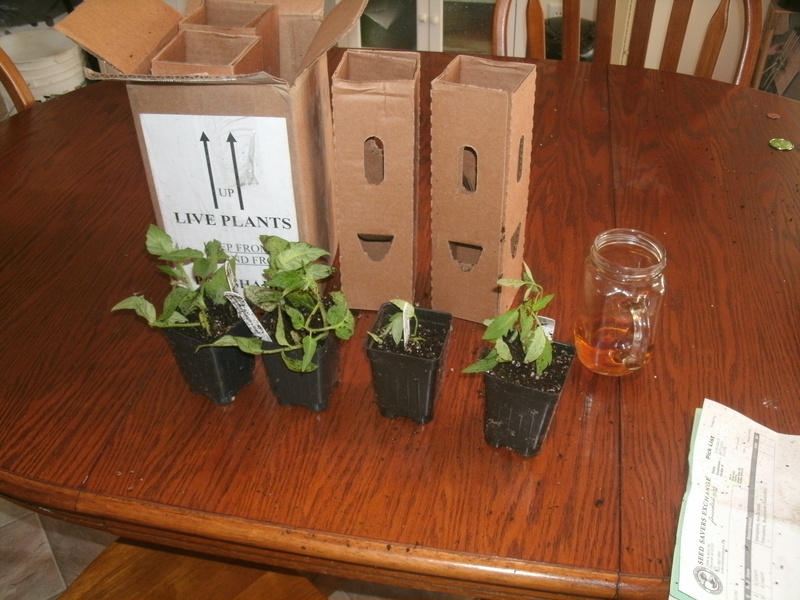 Seeds and Plants from the Seed Savers Exchange: Product Test of Live Transplants. I am bit behind in writing about the seedlings and plants that we are trying out from the Seed Saver Exchange. I planted 32 (3 plugs are flowers from my mother) plugs of vegetable seeds and all but one sprouted and it is a cabbage seed plug so I am very pleased with the germination of these heirloom seeds. My rate would be in the upper 98%. With using a new company for my garden I wanted to try a few of their transplants to see if the extra price would be worth it in the future. Replacement plants are free of charge or exchanged for seeds. I was hoping to get away with not having to seed start my tomatoes and peppers in the future. 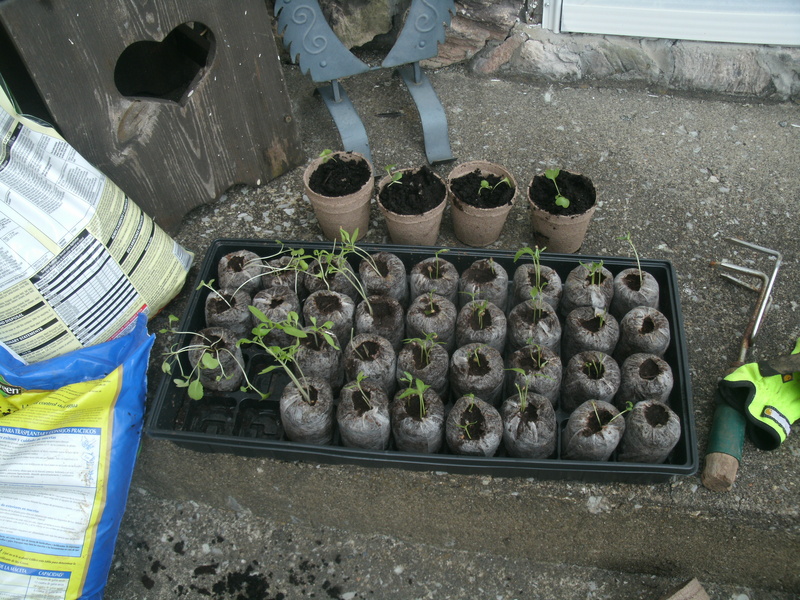 36 seed plugs ready for transplanting… lost a few seedlings to our new cat. As I prepared for the transplanting my seedlings, I finally noticed that some on my sprouts looked damaged, from what I had no idea. I discovered after moving the transplants back inside that our new cat may have caused the damage. She seems to like greens and sprouts and has chewed on several and even destroyed one of my house plants that is near her favorite resting spot. I have lost plants to just about everything in the past… dogs digging, rabbits, deer,moles/voles, birds but never in my life to a house cat. At least she seems to like tomatoes the best and I have more than my share of seedlings so this will not effect my garden plan. I also received my transplants in the mail just yesterday. The the plants were in plastic pots surrounded in a cardboard tube. Then all four tubes get packed in a bigger box. With a small cardboard shield over the top soil in each tube. Here is a photo to give you a better idea what I got. The plants get delivered by UPS and left out on our front step. An e-mail message arrived from the company that the plants were due to arrive that afternoon. They hoped this would prevent them from being frozen or roasted in the boxes . I love that they warn people that they are on the way so I could be looking for them. At this point I had unpacked the plants as genially as possible but dirt still went everywhere. The shield was off the smallest plant and it was almost up rooted in the tube. This is after I “Fixed” the plant back into the pot. Then as the instructions state they needed watered ASAP. It was then that I noticed the damage to one of the large Brandy Wine tomato plants the stem had broken off at pot level. I removed the stem and water them all putting them with the rest of my transplants. In this case they only look about two weeks ahead of mine and the Brandy Wine looks like it is ready to plant but the Amish past is still very frail. I will contact the Exchange about the one broken plant in the tube and the tiny Amish Paste. I want to see if instead of plants I can get Straw Flower seed for my flower box and crook neck squash seeds that my older son wanted in the garden. As an update over the weekend 4 days from the plants arrival, the one damaged plant and one small plant both died. So my results were about 50 % and that is not good enough for me. I will not buy transplants again any time soon as they are about 4 dollars a piece and are a lot of trouble to unpack. The plants were not as large as I had hoped even though they look healthy. I will stick with the seeds and start them at home and save myself the money for the plants to buy more plugs in the future. I wonder if they could package them better if they were to fallow some other companies shipping methods for plants. The bare root method would seemingly work here but I am just guessing. Large plastic bag, live plants with bare roots inside a box? I just think even the peat moss plugs that I use would be more stable to ship then plastic pots with loose dirt and more earth friendly in the long run. Now it is time to get started with the garden work that will be over the next three weekends. We are tilling up a new space and that will be a lot of work and getting some kind of fence up will take some time to finish so as always I am feeling behind and we have so much going on inside the house. Thank goodness Tom likes having a garden as much as I do and he will chip in his time to till and put the fence up for me. The rest is usually up to me and I think I am up to it as the days get warmer and longer I just feel the need to get in the dirt again. 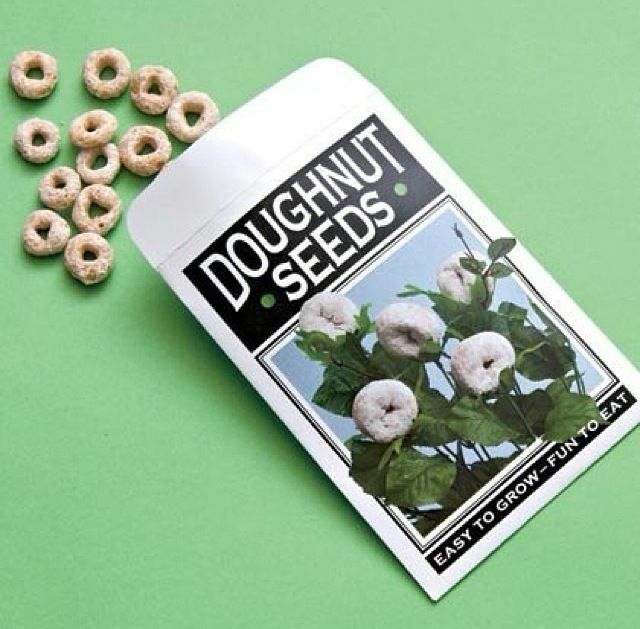 Just in case the Seed Savers Exchange is hard up for the seeds to replace the plants, I will ask them if they have this seed….. They make me so happy just thinking about them. Happy Gardening from Mountain Mama. Tom and I have decided to try to have a totally Heirloom garden this year. We want to join the Seed Savers Exchange to save Heirloom , untreated, Non hybrid, Non- GMO seeds. So with a new garden and new seeds comes new challenges. 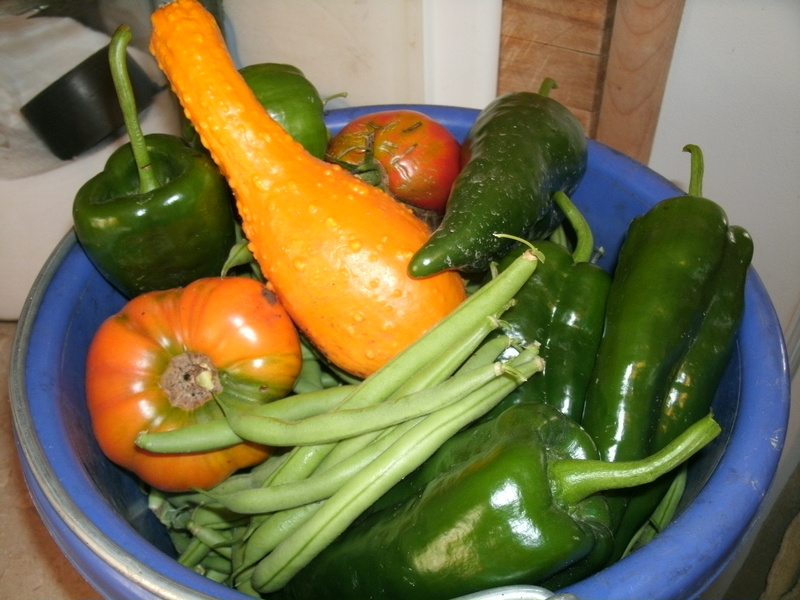 We do raise our garden in an organic way so saving heirloom seed just makes sense. This is the process that my aunt, uncle and grand parents used to raise their gardens.They raised a crop, saved the best seeds and planted again, simple, direct and generally easy if the crop was healthy. This process does not work very well with Hybrids. 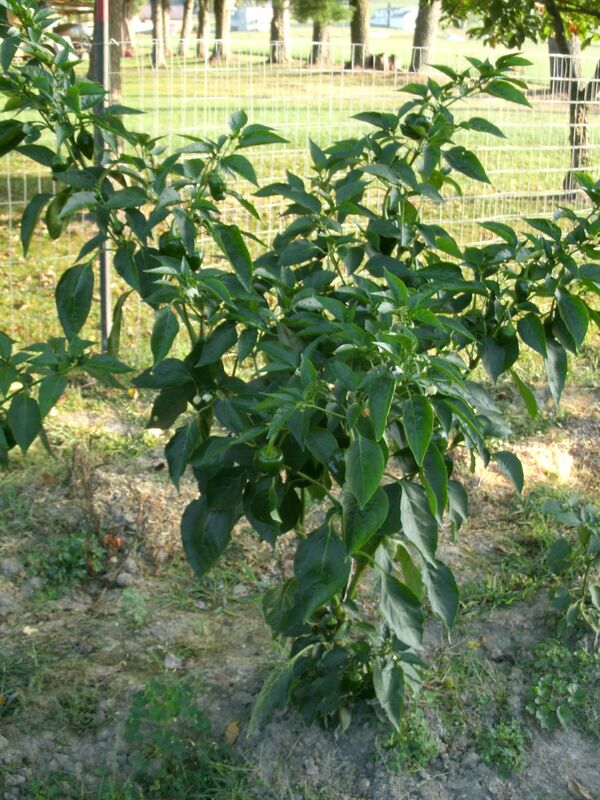 Have you ever tried to grow a fruit tree from seed at the grocery store? 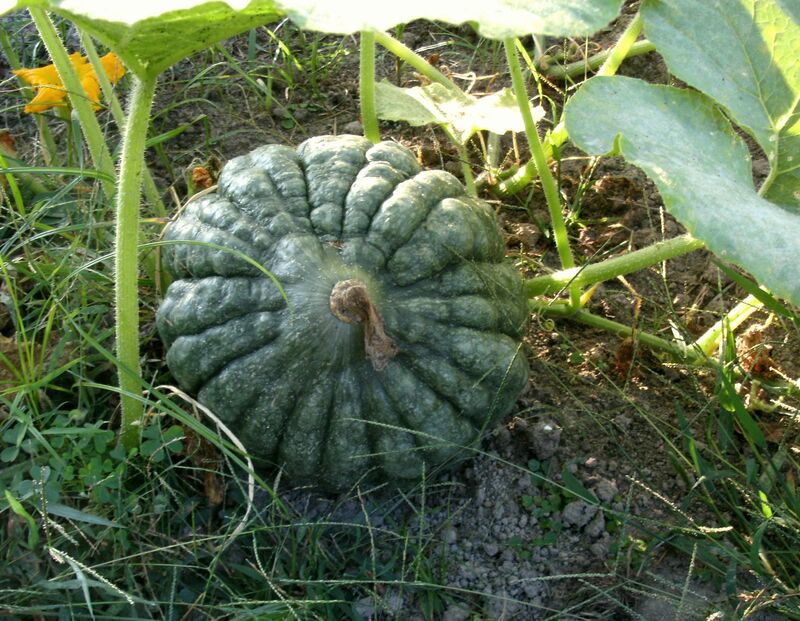 Have you ever tried to grow an acorn squash and gotten some other kind of squash from the seeds you collected… I bet you have! 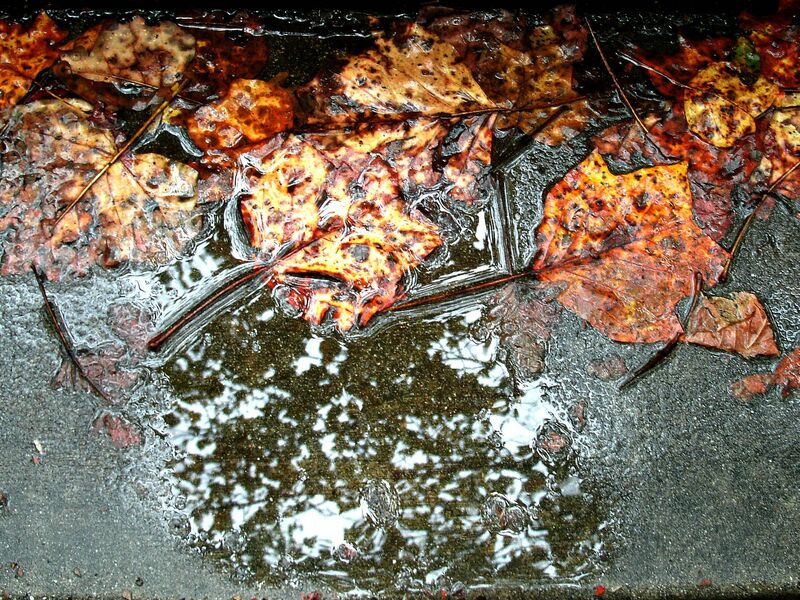 The above photo is of an experiment Christopher and I did two summers ago. If you find the most wonderful vegetable, and want to grow it from seeds that you save, will you eventually grow what the parent crop was? 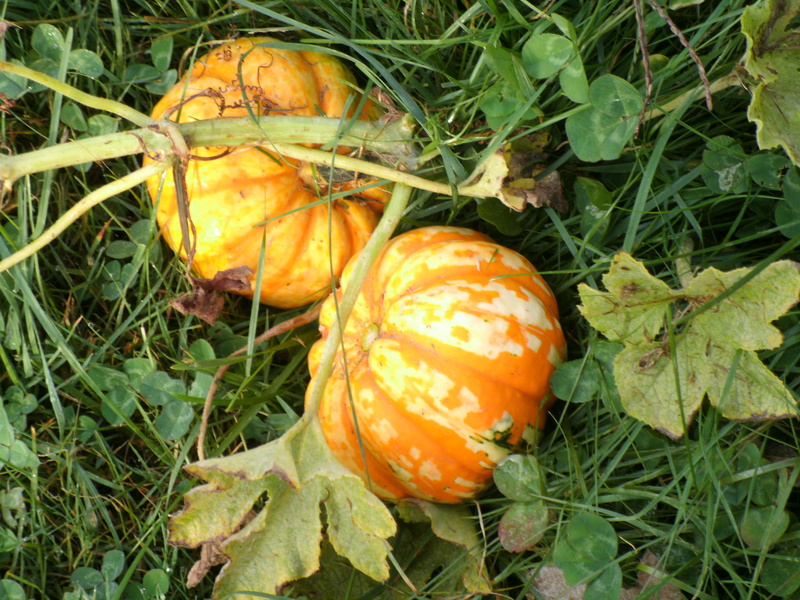 The answer is No in most cases… and this is proof that Hybrids are not reliable in self-sustaining gardening. This is the result of growing a seed from a Hybrid Acorn squash from a Kroger grocery store. 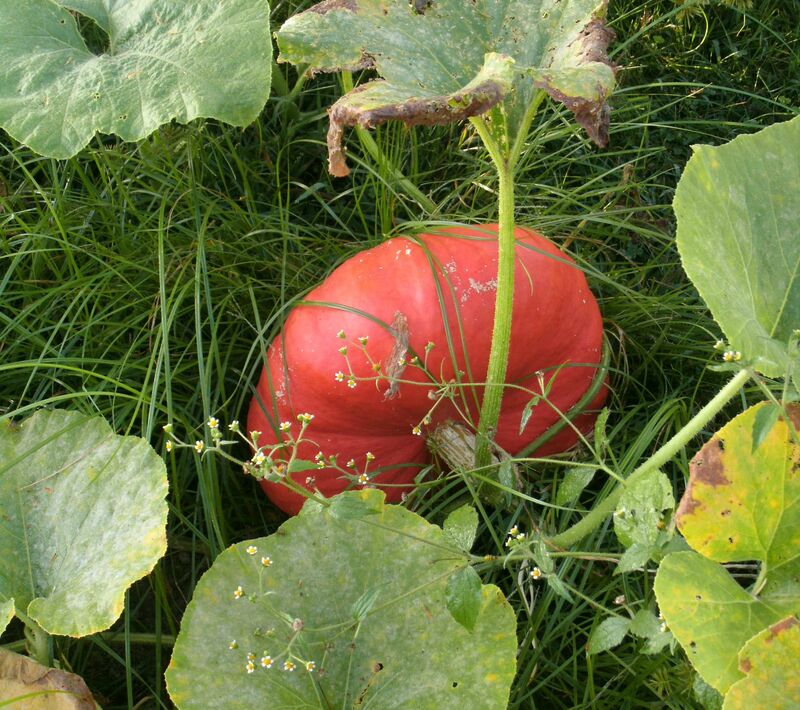 I understand that in this case the “Squash” needs more water to grow to a bigger size but I am thinking that this is not growing an acorn squash at all but a pumpkin crossed with an acorn squash. I am looking harder at what I want to accomplish with my garden. First, I want to feed my family healthier food. Second, I want to learn better ways to become a self-reliant person. Third, I want to be able to reseed my garden if that time comes that I need to or that I want to. Seriously, I think that it is really wonderful that if I save seeds I can share them with others who also like the plants I grow and they too will have their own means to feed them selves without ever having to go to a manufacture to get food seeds or be left with seeds that do not produce.I also like the idea of seed sharing and the history around some seeds. 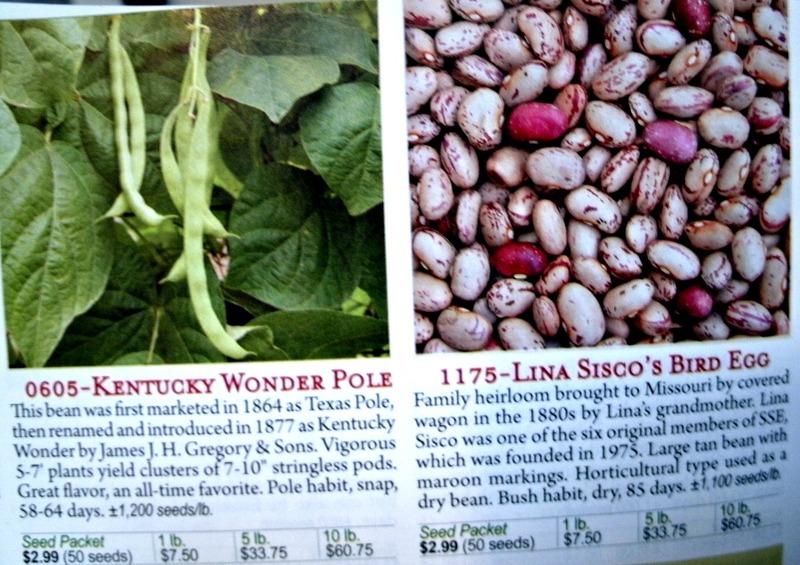 At the Seed Savers Exchange you are able to get the history of every seed in the catalog. 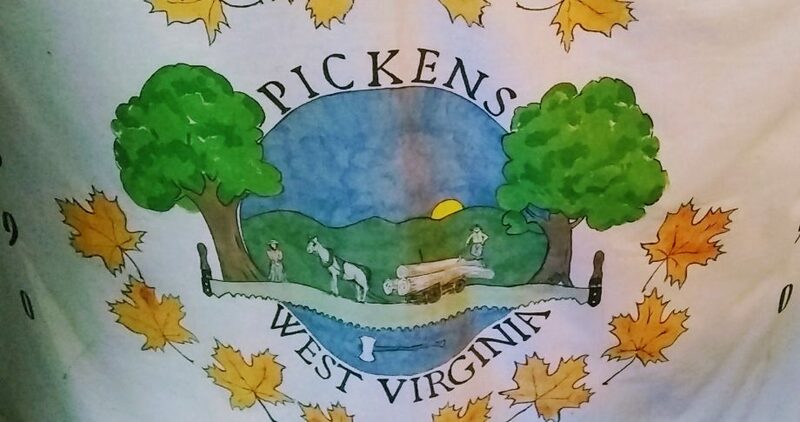 Really cool stuff here if you like to know about where you food really comes from. Here is a typical page in the catalog. So today I am in the process of making a list of the plants and seeds I want to grow in the new garden. I have Sweet potato roots ( from stock that is 40 years old) from last year stored away and ready to sprout for this years garden. I will start them in my window in about two weeks. I want acorn squash that actually grows acorn squash, lots of pole beans (snap and dry), cantaloupe, watermelon, tomatoes, peppers (hot and sweet), brussels sprouts,cabbage, pumpkin and parsnips. I think that will get me through this year with a small new garden. Again for more information on the Seed Saver Exchange and how it all works visit their website and look at the large verity of flowers, vegetables and apple trees these people are trying to save and share for future generations.